If you want to learn the secret to unleash civility in your workplace and in your life, you are in the right place. Follow the 5-steps of Diana’s CIVILITY tool, and you’ll begin to connect at a deeper level, communicate more effectively, and build enduring trust. Please fill out the form on the right and download your free tool. 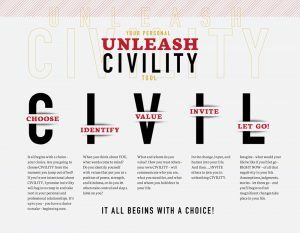 Let’s Unleash Civility! *Items with asterisk are required.